Being 1½ times the size of the Benelux countries, Latvia and Estonia have a combined population of under four million, so there is lots of space for the ‘great outdoors’, much beloved by the locals. This holiday includes a visit to a National Park in both countries. But where there’s a coast there is trade and the Baltic gives us two of Europe’s most vibrant and colourful capitals. 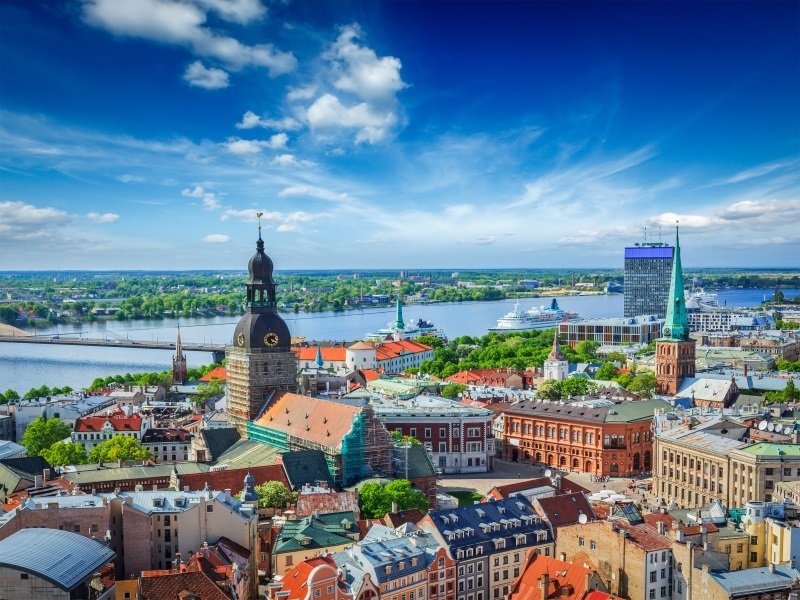 Riga and Tallinn have a history of being open to the outside world – both were members of the great Hanseatic League, channels for trade between Eastern and Western Europe, from the 13th century. There’s also the chance to hop across the Baltic to visit Helsinki. Day One: Flight to Riga, Latvia. Transfer to your hotel (20 minutes) for two nights bed and breakfast accommodation. Riga is a city of contrasts. While there are hints of WWII damage and Soviet restoration, the UNESCO-protected Old Riga with fine buildings and a maze of cobbled streets and squares remind us of its medieval origins and its concentration of art nouveau architecture is unique. Don’t miss the 13th-century Dome cathedral, the biggest Church in the Baltics, or the Blackheads’ house, where the tradition of the Christmas tree supposedly originated – they covered a tree in flowers and then burned it, thankfully that part didn’t catch on! Nearby is the Art Nouveau centre, with no less than 750 flamboyant twentieth-century buildings, more than anywhere else, festooned with goddesses and griffins, gargoyles and goblins, plants and flowers – many the creation of Mikhail Eisenstein, father of the great cinematographer, Sergei. Days Two: Morning half-day walking tour of old Riga followed by a scenic drive through the Art Nouveau district of Riga. The rest of the day is free. Day Three: Depart after breakfast for Tallinn in Estonia. The main stop today is the pine-forested Gauja National Park forty miles outside Riga. Your tour in the park includes the ruins of the medieval castle of Sigulda, the fairy-tale red-brick castle of Turaida which has not just excellent views but also an interesting range of attractions in the castle grounds, and Gutman’s cave where your guide will tell the tragic love story of the Turaida Rose. After an included lunch in a chalet restaurant in the park you head north to Tallinn, a further 182 miles away for four nights bed and breakfast accommodation. Tallinn: Whereas Riga has a slightly post-Communist feel to it, Tallinn – for all that it has its superbly pretty old town – feels much more Western. There is some enormous Russian-built architecture, but the modern business district seems almost American in its embrace of capitalism, and the Estonians certainly feel closer to Finland and the west than to anywhere else. Finland, after all, is just a couple of hours across the Gulf – the Gulf that featured the sailing during the 1980 Moscow Olympics. Tallinn’s Old Town lies within the city walls, and is an atmospheric place to stroll. Old merchant houses line the medieval cobbled streets, and hidden courtyards and impressive churches abound. Not far outside the old town are some very interesting museums: the futuristic Kumu Art Museum, the Ethnographic Open Air Museum, with an interesting collection of old cottages relocated from elsewhere in Estonia, and the impressive new Seaplane Museum, located in an enormous old Russian hangar. There is also a small KGB museum, located on the 23rd floor of the old Soviet Hotel – a floor which officially did not exist, but from where the KGB could keep a close eye on all the foreign guests! Day Four to Six: At leisure in Tallinn with two included excursions. One is a half day city tour of Tallinn, partly by coach and partly on foot through the old town. The other is a full day excursion to Lahemaa. An hour away eastwards along the northern Baltic coast towards Russia, the Lahemaa National Park (the first in the Soviet Union when it was designated in 1971) boasts a rich variety of flora and fauna, as well as fine coastal and rural landscapes. You will also visit Palmse Manor, with its large estate and varied attractions. Lunch is included in a thatched tavern. An optional excursion is also available to Helsinki. Finland’s capital is just two hours across the water. Helsinki has a long waterfront, and indeed the whole city seems to hover around a series of water-features – lakes, bays and inlets. There are several interesting museums and some impressive art- nouveau buildings. You will have a walking tour and free time to explore as well. Days Seven: Depart Tallinn for Riga. You break the journey in Pärnu, Estonia’s foremost seaside resort. The main street, Rüütli, is pedestrianised with shops and cafes. Just off Rüütli is St Catherine’s Russian Orthodox church, regarded as Estonia’s finest baroque church. Built in 1768, it is named after Catherine the Great and still serves Pärnu’s Russian-speaking population. After Pärnu, you continue to Riga for one night’s bed and breakfast accommodation. 195 miles today. Day Eight: Free time until you depart for the airport and your return flight home. Operated by Preferred Travel Services. ABTA No. W3692. Atol protected No 5537. Single supplements may apply. Subject to availability. The price was correct at the time of publishing and while very effort is made to ensure these are as accurate as possible , they can fluctuate suddenly due to demand.